Forget Bongbong Marcos as Prime Minister – Why Not President for 2022? Raissa Robles wrote; the planned parliamentary-federal form of government that is presented to the congress have a “dual executive.” This is the declaration of the University of Sto. Tomas Assistant Professor, Edmund Tayao. There is a president as elected by the people for a five-year term. He can run for re-election for another five-year-term as well. He appoints a Prime Minister who is a member of Parliament. The PM serves as head of government. Fellow members of Parliament elects him. The PM is in charge the day-to-day operations of government. Bongbong Marcos is likely the president’s choice for the position. [VIDEO]: AKSYON | Nagsalita na si Pangulong Rodrigo Duterte kaugnay ng napabalitang pagtatalaga kay dating senador Bongbong Marcos bilang interior secretary. Ulat ni Maricel Halili. Robles did not fail to compare the alleged plan to the Marcos-Cesar Virata tandem. 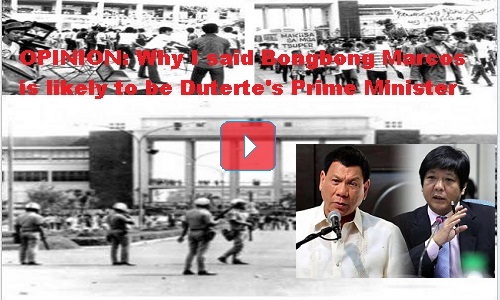 Marcos is a strong president and Virata serves as the workhorse Prime Minister who ran the government. Article IX of the 1973 Constitution defines the Prime Minister’s role. It states that “there shall be a Cabinet that shall be composed of Ministers with or without a portfolio appointed by the President.” Most of the Cabinet members who are head of ministries should come from Batasang Pambansa or the Parliament. Article IX adds that “the Prime Minister is the head of the Cabinet. He is nominated by the President from among Members of the Parliament. He must be elected by the majority members.” Under this set-up, a very strong President without can emerge checks and balances, according to Robles. Unlike the Marcos system, Du30’s set-up, as explained by Prof. Edmund Tayao, scraps the position of the Vice President. The succession process in case the President dies is also not tackled by Tayao’s team. Bongbong Marcos is likely to be the president’s choice for Prime Minister, according to Robles. They based the theory during the vice-presidential debate in April. Marcos discloses that PDu30 promised him that if he can’t solve the nation’s crime problems in six months, he will give the presidency to him and not to his running mate, Senator Alan Peter Cayetano. What about Bongbong Marcos for President in 2022? Currently, Vice President Leni Robredo sees the involvement of Bongbong Marcos in an alleged “concerted” online war against her. Robredo denounces that Marcos still couldn’t accept his defeat in the vice presidential race in the last elections. She again connected the May polls and the 1986 snap elections. She said that just like before, people need to show that they will not allow another Marcos to tamper election results. To the contrary, the obvious reason why she is attacked massively online is the people’s disgust in thinking that she really won without cheating. In truth, the president already announces that Marcos is not interested in any position but to know the real status of her win over him through the electoral protest he filed against her. It is more believable that she can face Marcos again in the 2022 presidential elections.